Duolingo is a popular language learning platform that graces millions of users for FREE. Back in 2013 we published a insanely popular Duolingo Review. Well a lot has changed since then and we’re here to highlight the newest features. Here’s our honest review of Duolingo French. I don’t get paid for any of these endorsements because… well.. duolingo is completely and utterly free. There’s no money changing hands. DuoLingo lets you practice languages without spending money! French, German, Spanish, English, Dutch, Swedish, Esperanto… you name it, they’ve got it. When people ask me how they can start learning French, Duolingo is usually one of the first resources that I tell people to try out. Why not? At the end of the day it’s a great way to test the waters and try out a language before you fully commit to it. And my friends who have tried Duolingo returned with nothing but positive feedback. Today, I’m not just going to recommend Duolingo, I’m going to show you why I do so. And unlike other DuoLingo reviews, I’ve spent hundreds of hours on the program to test every feature (including those for the mobile app). Not sure what DuoLingo is? No problem, we’ll address that here as well as what features are beneficial to language learners. At the very bottom of this review we also talk about how fluent you can become in French by using DuoLingo. DuoLingo is a do it yourself style of language learning software which can be found on the internet. It says so right on their homepage. Creating an account is free and takes a few seconds. I use my Facebook profile to sign up, the program doesn’t post to my wall or do anything obtrusive. Once you’ve signed up you’ll have access to learn a variety of lessons. Since this is FrenchCrazy.com, I’m going to assume that you’ll start learning French! You can follow my Duolingo profile, FrenchCrazy, and I’ll help watch your progress. Each lesson requires a certain amount of correct answers to advance. If you get a question right, you gain a point. When you get a question wrong, a correction will highlight what you did incorrectly and you’ll lose some progress. This concept helps make DuoLingo a more fun, engaging program. It’s more like a game and less than a tedious task (learning grammar/vocabulary, etc). Learners are introduced new vocabulary through both speech and text, then are asked to either translate words/sentences into English, or into French. There are also picture recognition questions similar to Rosetta Stone, where a picture is presented and you have to associate a word to it. Besides Duolingo’s lessons are the ability to participate in various language learning forums or help translate pages across the web. Duolingo is currently comprised of 78 modular lessons (or more because they keep adding to the list!). Each lesson has anywhere from two to ten parts. As you complete lessons, you slowly move down your “tree.” The lessons focus on a different subject matter, from adjectives, pronouns, and the present tense to clothing, food, and household vocabulary. In the example below, I browse the tree on my mobile device. I select the lesson “occupations” which has four parts to it. The follow screen tells your the words or vocal you’ll encounter in the mini-lesson. After completing the lesson, my skill is now golden! I can move on to the next rung of the tree once I’m done. I browse my tree, select my lesson, see what’s inside, and complete it! All in a day’s work. 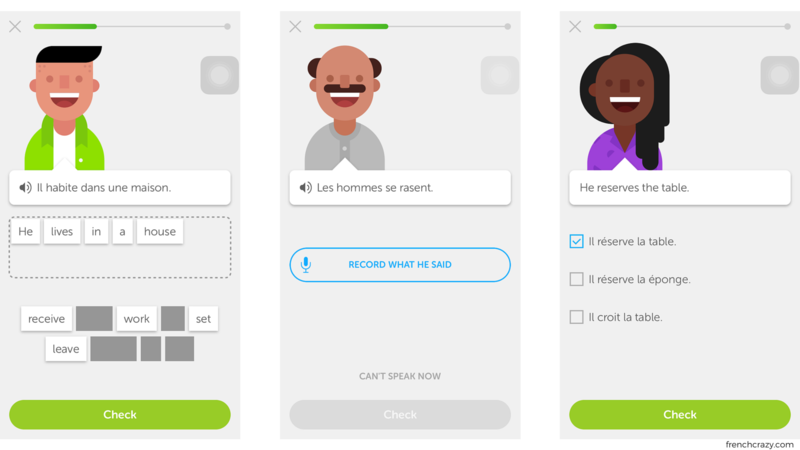 So what exactly can you learn in Duolingo French? There’s a good offering actually. The first way to consume Duolingo is on your phone or tablet device. Duo has a stable mobile app which offers you most of the features that you would find on their site. This means that you have French-learning at your fingertips 24/7 for free. There’s essentially no excuse not to practice anymore. The mobile app has an intuitive design, quick loading, and a decent array of questions. You’ll be asked to translate sentences from French to English or vice versa. The questions are accompanied by “authentic-enough” French audio. There are also a few where you record your voice in French and you’re judged for accuracy. Others are simple matching or fill-in-the-blank sort of activities. Each lesson mixes the different question types. Your goal is to answer enough questions to pass! If you answer a question correctly then a bar at the top of the screen will inch towards being completely full. If you get a question wrong then the bar will lose progress. Before, Duolingo used hearts to further enforce the gaming aspect. As you made mistakes, you would lose a heart and you had only started with three. The concept frustrated users because people didn’t like having to restart a lesson due to losing all their hearts. 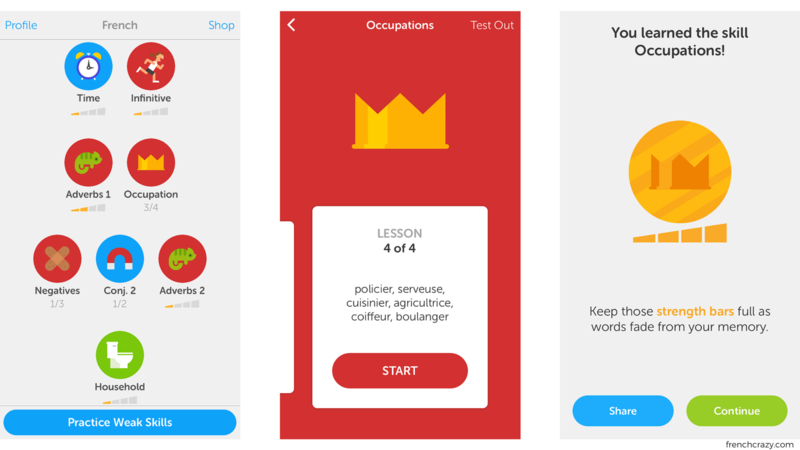 The mobile app features a variety of questions to test your French skills! One of the cool things I like about the mobile app is that it’ll send you notifications if you haven’t practice your language for a while. Now, you can turn these off if you find them bothersome, but I like how the app encourages you to keep on practicing. 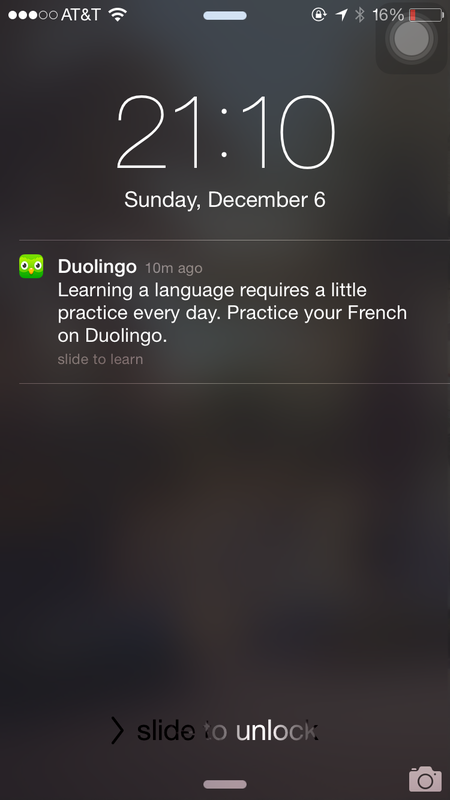 Learning a language requires consistent input, so Duo is taking a step in the right direction. But overall, the desktop version of the site is just so much better. Under every question you’ll have access to “forums” where people discuss difficulties or insights. The desktop version also has the user discussions and the ability to translate material. Not to mention there questions are slightly more challenging and varied. I also prefer to type out my answers with a real keyboard and not my phone. After extensive testing I believe that DuoLingo, deserves the raving reviews it receives. Overall, DuoLingo is certainly a good resource to aid yourself in learning French. It’s motivating, it’s fun, it’s easy, and it’s free. Now with a mobile application, you have no excuses not to practice on the go! I think the greatest benefit is there for those who wish to either learn beginner French (a starting point), or those who want to brush up on their skills. I believe DuoLingo should be seen as a complimentary tool and not your main mode of learning because it lacks grammar lessons. They’ve tried to implement this more and more. DuoLingo emphasizes that you go back and review words and concepts over time. There is a large community on the forums so that if you stumble across any problems, you can discuss it with other language learners. But don’t take my word for it, keep reading and see what some users think down below! DuoLingo released a scientific studying saying it is more effective than college courses or the king of Language Software, Rosetta Stone. While I do find it superior to Rosetta Stone (I mean, have you checked the price tag? ), I would disagree with the stance of it being better than a college course. DuoLingo is certainly changing the way people learn languages; it has extensive amounts of vocabulary & grammar, but it lacks in verbally speaking with others. Besides, you learn more than just vocabulary and grammar in a language class; you learn about culture and the art of human interaction. I have really enjoyed doing Duolingo over the last year, I have completed the activity tree twice and reached level 21 and 52% proficiency; what is the next level? I can’t find any way to progress and i can’t get any answer to the questions i post about this under the help section. I just started using Rosetta Stone for French and have supplemented using Duolingo. I enjoy it as a supplement and the fact that the app is free and I can use it at work here and there with free moments. I have been using Duolingo for Spanish (I am a complete beginner) and French ( I learned a small amount at school many years ago) for a month or so now. Though, I have abandoned Spanish in favour of French for the time being due to French being the language I feel most confident in and finding it a bit too difficult to lern 2 languages at once, I absolutely love it. As a previous poster said, it doesn’t feel like learning as much as a game (though I love learning anyway). I think what makes it so effective is the instant feedback you get and the constant repetition and recycling of previously learned vocabulary and grammar. I personally think it is an amazing programme and, whilst it is definitely no substitute for face-to- face interaction with native speakers it is certainly way up there as one of the best ways to teach yourself a language fif you don’t have access to native speakers or can’t afford regular classroom lessons. After using the programme and reaching level 10 in French I feel that were I to now enrol on a ‘proper’ French course I would make rapid progress as my knowledge of grammar has improved so much that I would feel much more confident about speaking French to others since using the programme. CAN DUOLINGO MAKE ME FLUENT? If you haven’t done so already, check out this link to see a comprehensive article on French Fluency. I’ve heard claims that Duolingo can make an A1 individual advance up to a B1 level. While this may not be fluent, it would be a great start towards your development in the language. I sometimes see success stories of people who were able to test out of lower level college courses simply by brushing up or using Duolingo. It’s a great place to start any language. I’ve used Duolingo for Italian and I love it. If you decide to start the program then we can follow one another’s progress! My username is FrenchCrazy. Let’s learn languages together (in my case those would be Italian & German). Want to comment? You can share your thoughts on our FrenchCrazy Facebook post.